Want to go to a show that is coming into town? Feel like getting up a group to go camping? Whatever your idea for a group activity, just let the webmaster know a week to a month in advance, and it will be posted here and, if there is time, in the newsletter. Note that any Mensan can start a local SIG on any topic that may be of interest to other local Mensans. SIGS (Special Interest Groups) may be social (Movie Night SIG); intellectual (Book SIG); or activity based (Kite Flying SIG). Simply advertise your SIG in the newsletter and on the website, and see who shows up! Taste of India, 401 Mall Boulevard, Savannah, GA. Tel is (912) 356-1020. Please call Kathy Haile at (910) 391-9412 2 days before to make your reservation. If you come during your birthday month, Mensa will buy your meal! If you don't make a reservation and decide at the last minute to join us, please come to the restaurant! There is always room for one (or two or three) more. Schedule: January 19, 6pm; February 16, 6pm; March 16, 6pm, April 20,6pm; May 18, 6pm; June 15, 6pm; July 20, 6pm; August 17, 6pm; September 21, 6pm; October 19, 6pm. Games Night is suspended until October. Susan Daggett and Ron Cole will be unable to host until then. If someone else is able to host, please contact Susan's cell (912) 650-0693, or to email click here. This SIG (Special Interest Group) normally runs Oct-Nov and Jan through May, usually on the first Saturday of the month. No G & G in April 2019, unless someone else volunteers to host that month. The Bon Vivant SIG (Special Interest Group) is for those who love good restaurants and great conversation. The Bon Vivants alternate between South Carolina and Savannah, GA. Mark Ishige (843) 476-6957 is the contact person in South Carolina and Kathy Haile (910) 391-9412 is the contact person for Savannah. Please RSVP to the contact person by Thursday before the Bon Vivant as reservations need to be made in advance. If you decided to attend after the RSVP deadline, please contact the restaurant directly and say you will be joining the Bon Vivant or Mensa group. April 27, 6pm: Mediterranean Harbour, Shelter Cove Harbour, 13 Harbourside Lane, Hilton Head, SC, phone: 843.842.9991, website, To reserve a place, please email Mark Ishige at markishige@embarqmail.com by Apr 25. May 25, 6pm: Pacci, 601E. Bay St., Savannah 31401, ph. 912.233.6002, Contact Kathy Haile, katherinehaile@att.net, or 910.391.9412, by May 23. June 22, 7pm: Griffin Market, 403 Carteret St, Beaufort, SC, phone: 843.524.0240, website, To reserve a place, please email Mark Ishige at markishige@embarqmail.com by June 20. No Bon Vivants are scheduled for November/December due to holiday season. Gather in a meeting of the minds to discuss the philosophical topic of the week. 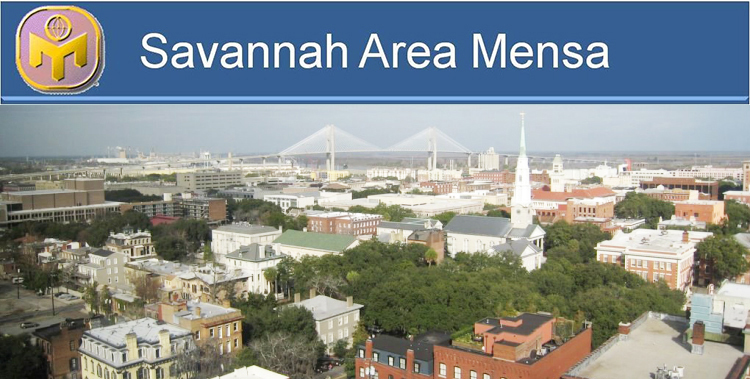 Though not a Mensa sponsored event, this event has a regular Savannah Mensa attendance. This event is open to anyone. Al Stiles is initiating a SIG (Special Interest Group) for those who want to play bridge, or learn the game. Please contact Al at 912-349-9977 for details. If you are or have a child under the age of 18 who is in Mensa, there is a new SIG forming just for you and your family. Please contact Kathy Haile at (910) 391-9412 to let her know that you are interested in this new SIG. All meetings are open to members, spouses, significant others, Mensa wannabees (those who have tested or are awaiting a test date), and invited guests. Hosts of events held in private homes may need to restrict attendance. depicted for example in U.S. TM Reg. No. 1,405,381) are registered in the U.S. Patent and Trademark Office by American Mensa, Ltd., and are registered in other countries by Mensa International Limited and/or affiliated national Mensa organizations.